One of the great mysteries of the Battle of Hastings is where did William take his men for burial and where did he bury Harold? In Poitiers he states that he returned Harold’s body to his own camp “having arranged honourable internment of his own men (150)". This might be presumed to mean that they were buried with honour at a religious site (possibly the Chapel at the camp). The Carmen makes the same claim and so I decided to look for a mound that would fit the description of the burial site, on the headland overlooking the shore and the sea. After searching for several months I located a mound that appeared to fit the description. I shall not put the location in print just in case it should be accidentally published prior to investigation. This could result in attracting treasure hunters who might believe that any remains could be removed. Those qualified to deal with such an investigation will be advised of the exact location. The mound is close to the top fort and overlooks the shore and sea exactly as portrayed in the manuscripts we have looked at. An initial excavation revealed that it is not of the construction of the surrounding soil, which is sandy soil getting progressively more compact the lower you excavate. Having never excavated what might be a burial mound I proceeded very slowly. The picture above shows the construction. The top foot was relatively compact soil however below this was a pile of flat stones, covered with soil. Unlike any other excavations that I have completed the soil appeared to become looser the further down the hole I dug. The above excavation took several days as I was for ever in fear of damaging any remains that there might be. However I decided to stop at approximately 80cm because this was the depth that I had found an image in the first mound at the lower fort. 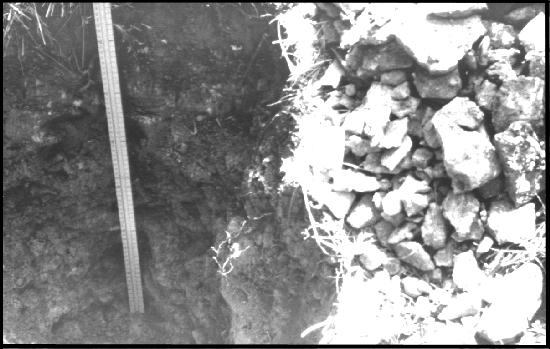 The following photograph shows a picture of the stones at the bottom of this 80cm excavation. 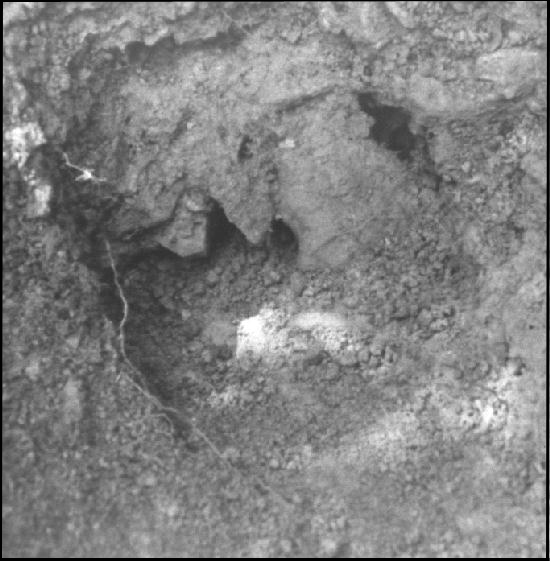 This shows the loose nature of the soil and the clear indication that the stones have been laid. The aperture beneath the main central stone was not caused by the excavation but was already there when excavated. The site in question is completely devoid of the type of stones found in the mound. At this time I have every reason to believe that this site may indeed be the burial mound of Harold Godwinson, the last Saxon king. History has taken the view that in the absence of positive identification of a grave William must have done the right thing. The proposal that he might have offered Harold a Viking funeral, under a pile of stones on a headland, was only questioned in retrospect after his death. Surely no great man would do such a thing to another king? This was of course the view of the victors, rather than the vanquished, with the benefit of hindsight. I therefore believe that it is quite logical for those nearest the actual events to have given a far better account of what really happened. This is the reason that I have only looked at evidence from manuscripts written in the first 150 - 200 years after the battle. In that respect there appears to be a complete agreement (with the exception of Wace who says he does not know who took the body to Waltham, yet appeared to know everything else about the events). Wace appears to be offering an apology in this account and may have already heard the other stories about the burial and therefore sought to justify the story he had heard. In any event I consider the mound of paramount importance in respect of needing professional archaeological investigation. There is every reason to believe that if the other evidence provided here is correct there is a case to be answered that this mound may be the burial site of the last Saxon king of England. If so there would also be a case for Harold to be given the Christian rights that William denied him. He should be reinterred in the church that was always his destiny to be buried. It was his right as king, albeit as such for only nine months, to be buried with his friend and confidant Edward the Confessor, in Westminster Abbey, with appropriate and due ceremony. The building was made for this purpose and I believe Harold was done a great injustice by denying him this right. Harold was the strong man of England and the heir apparent. He fought his brother and the king of Norway at Stamford Bridge defending York and England against invasion from the Norwegians. I believe he has been falsely painted the villain or fool by history, because of lack of information. It is my belief that these matters will all be re-evaluated when all the information is made available. In the meantime I would like to re-evaluate the evidence of the site requirements according to the manuscript evidence listed on pages sixty three to seventy. This will allow us to establish what level of credence to give to the information provided to date. You will recall that there were forty different aspects of the site which could be directly related to written evidence from the period concerned. It might be reasonable to expect at least fifty percent of these findings to correlate since most appear to be fairly specific. With this in mind we will now re-examine the forty points concerned.